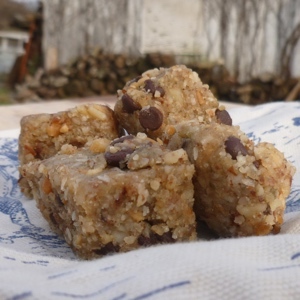 This is an amazing protein bar without much sugar. The texture is smooth and not sticky, and it stays together even without dates. You'll love this on-the-go snack! Grease a 9" x 13" glass dish with coconut oil. Begin by making the marshmallow binder for the protein bars. Place maple syrup, honey, egg whites, and vanilla extract in your mixer. Whip or beat on high until gentle peaks form -- this should take around five to eight minutes, depending on your mixer. While the egg mixture is whipping, grind all of the nuts, seeds, and coconut shreds into a semi-coarse texture in a food processor or blender and mix together in a large bowl. I just used a mixture of all the soaked nuts I had on hand. Feel free to experiment! Add lemon peel and chocolate chips, and mix until combined. Heat water over medium heat while slowing adding gelatin. Once the gelatin has completely dissolved, remove from heat. When the egg mixture has begun to peak, slowly add gelatin water while continuing to whip. Allow to mix for another five to eight minutes, until the mixture has begun to thicken up. Once egg/gelatin mixture is thickened, quickly combine with nut/seed mixture and mix until all ingredients are evenly distributed. Pour into the greased dish and refrigerate overnight. In the morning, you will have a great on-the-go or simply anytime protein snack! *Learn how to soak nuts and seeds here. **We like these these no-sugar, stevia-sweetened chocolate chips. This recipe is quite flexible, so you can even just use entirely honey, or entirely maple syrup. Also, if you want to omit the chocolate, I would probably omit the lemon peel as well.